The screen used to edit the data in MVO mode.The displayed data is that corresponding to the MVO mode input in Sample 2. Note the returns in the table are designated as being geometric means. 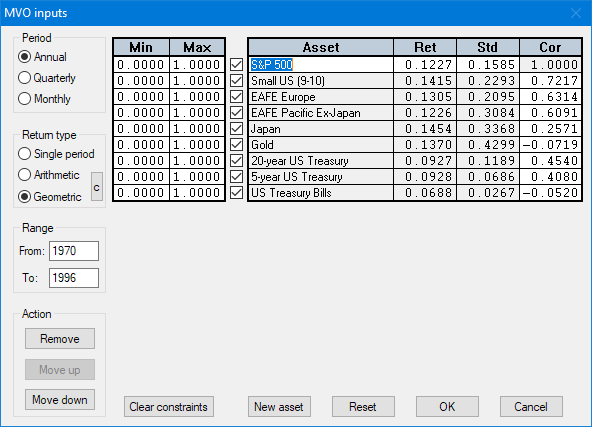 The currently selected asset is "S&P 500" and the Cor column displays the column of the correlation matrix corresponding to that asset. The screen is designed to accommodate up to 20 assets without the need for scrolling. While the currently shown information corresponds to historical data, users are free to change the range to some period in the future, and edit the data in accord with their beliefs.